Please read Part I of this article. 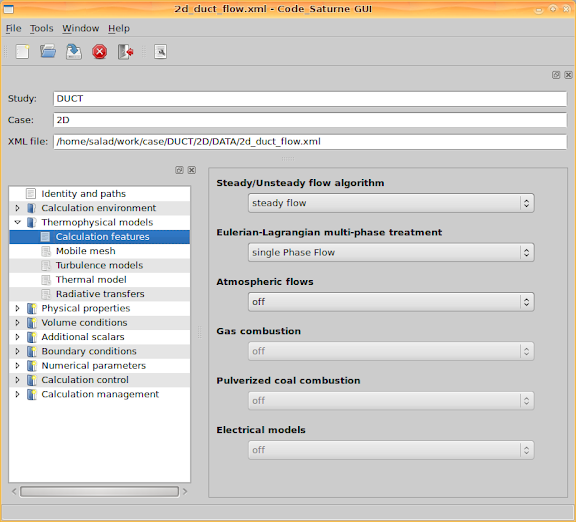 After the mesh file is produced from SALOME, Code_Saturne can be used for a CFD calculation. Note that I take Code_Saturne 2.0.0 as an example in this post; if you are still using Code_Saturne 1.x, remember some commands and directory names are different. 1. Create a study with a case. *. 2D: The case directory. A study can have several cases; for example, different boundary conditions can be organised as different cases. *. POST: This is an empty directory designed to contain post-processing macros (xmgrace, experimental etc). *. 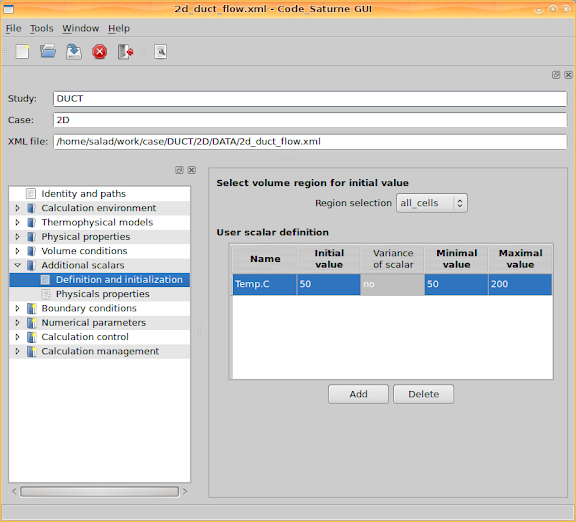 DATA: Contains the script to launch the GUI SaturneGUI. *. RESU: Directory where the results will be exported once the calculation has finished. *. SCRIPTS: The launching scripts are copied here. The CFD calculation is actually started by executing the launching script 'runcase' here. *. SRC: The user subroutines are saved here. During the compilation stage, the code will re-compile all the subroutines that are in this directory. In the 'REFERENCE' directory all the user-defined subroutines are stored. For a specific case you will only need a few of them depending on the changes that you want to implement on the code. The 'base' directory contains the basic flow solver subroutines, and the other directories contain the subroutines needed by other modules. 2. Use GUI to input parameters. 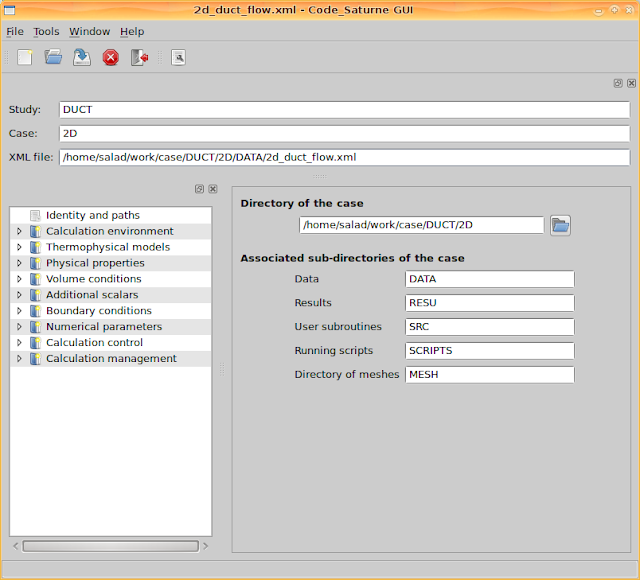 Ship into the directory 'DUCT/2D/DATA' and then execute 'SaturneGUI' to launch the GUI. The parameters set with the GUI can actually be saved into a XML file, and as such for a second time to launch the GUI, option '-f' can be used to load the XML file directly. The first glance at the GUI is like this. It lists the structure of directories. With the help of the navigator at the left panel, we can go to different pages to modify various parameters. 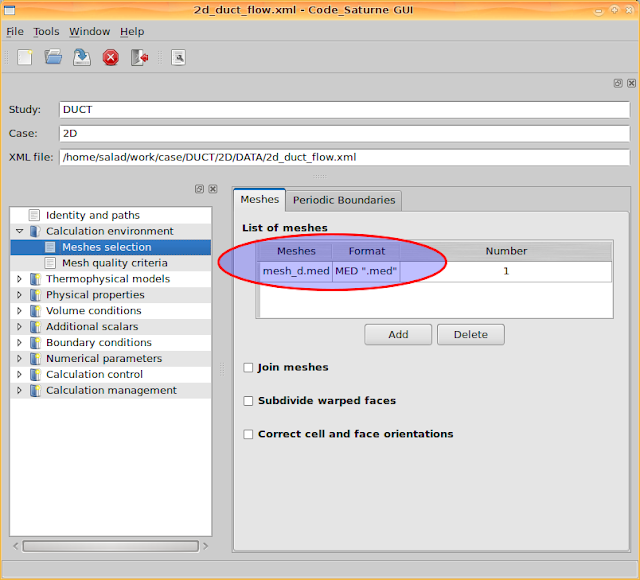 Go to 'Calculation environment > Meshes selection' and add the mesh file 'mesh_d.med'. It can recognise mesh files from the directory 'MESH'. Go to 'Thermophysical models > Calculation features' and enable two features, 'steady flow' and 'single Phase Flow'. 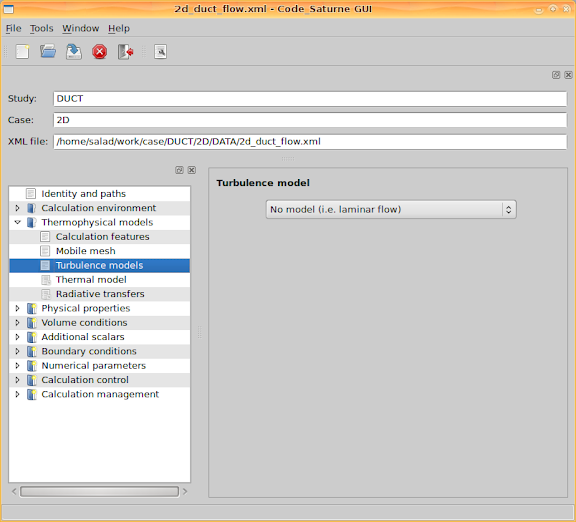 Go to 'Thermophysical models > Turbulence models' and select 'No model (i.e. laminar flow), since we ignore turbulence and only consider a laminar approximation. Besides, select the 'Thermal scalar' to be 'Temperature (Celsius)' on the page 'Thermal model' and select 'No radiative transfers' on the page 'Radiative transfers' as we ignore radiation. Go to 'Physical properties > Fluid properties' and set the four fluid properties: density, viscosity, specific heat and thermal conductivity. As shown in the following figure, we set specific heat and thermal conductivity as constant values, and leave density and viscosity to the user subroutine 'usphyv'. Therefore, the reference values set for density and viscosity do not matter. In 'usphyv' the parameters could be controlled as temperature dependent. It will be discussed in the next section. 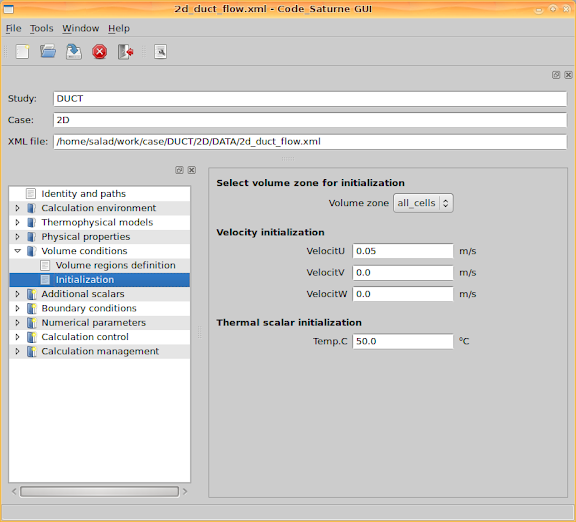 Go to 'Volume conditions > Initialization' and set initial values for velocity and temperature. Here I set the x component of the velocity as the inlet velocity value, and set the temperature as the inlet temperature value. Go to 'Additional scalars > Definition and initialization' and set the scalar limitation for temperature, including its minimal and maximal values. Next step is about boundary conditions. Firstly, boundaries have to be defined. 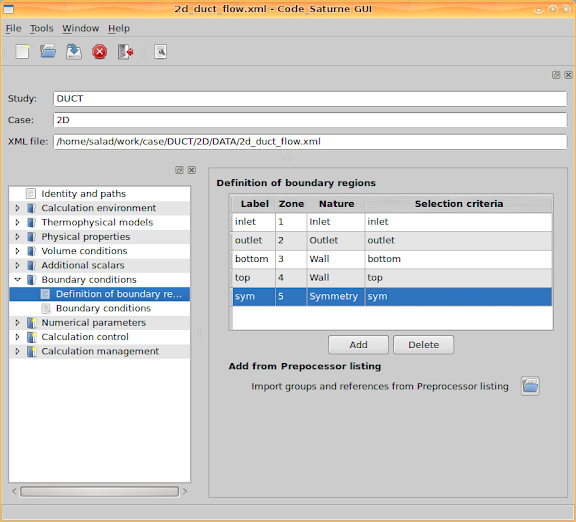 Since we used SALOME to generate the mesh, according to the defined mesh groups, inlet, outlet, bottom, top and sym, corresponding boundaries can be defined. For more details about the mesh groups, please see Part I of this article. 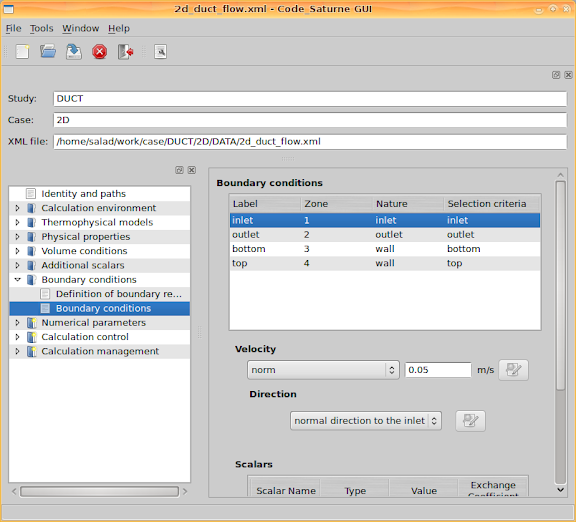 Secondly, go to 'Boundary conditions > Boundary conditions' and set values for the boundaries. I set the inlet velocity and temperature, and set minus heat flux values at the two walls. Negative heat flux means the heat is into the channel. Additionally, the walls are set as smooth walls. Leave 'Numerical parameters' with the default values, and go to 'Calculation control > Output control'. Then set 'Output listing at each time step', set output 'Post-processing' 'Only at the end of calculation' since we are concerning a steady state calculation result. With respect to the 'Post-processing format', either 'Ensight Gold' or 'MED' can be specified. If you prefer to use ParaView, select 'Ensight Gold'. If you want to use SALOME to do post-processing, change the option to 'MED'. Then go to the second tab page. This page lists the 'Monitoring points coordinates'. When the calculation is being performed, the quantity values at these coordinates will be recorded for each iteration step (each time step if it is a transient process). The result could be like this figure below, from which we can see all the values are already stable after 70 iteration steps. It implies a criterion to stop the calculation after a number of steps. Actually cs plot_probes command instead of xmgrace -nxy could be used to draw the graph of the values at the probes; it's a wrapper around xmgrace with a couple of file manipulation. 3. Apply FORTRAN user routines. As mentioned the fluid density and viscosity could be configured as temperature dependent by modifying user routines in 'usphyv.f90'. Adopting FORTRAN code to control the calculation details brings enough flexibility to Code_Saturne. All user routines/FORTRAN files are put in the directory 'SRC'. Look up the sub-directory 'REFERENCE' and see all the routines you can modify. For fluid properties, copy the file SRC/REFERENCE/base/usphyv.f90 into SRC and then modify the copied file in SRC. T is temperature. Actually 0.00065 is the fluid expansion coefficient due to temperature. Note that the first line set the variable 'iutile' to 1, otherwise the code implementing the equation will not take effect. For viscosity, find the code piece, assign 'iutile' 1 and modify the following code as whatever viscosity equation you would try. With the density code example, it is not supposed to be difficult. 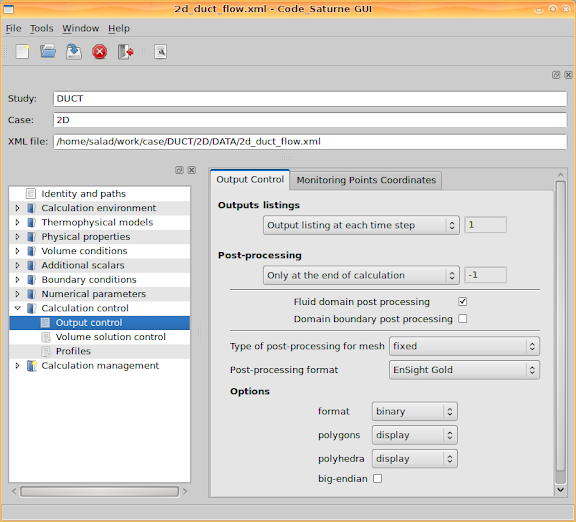 After configured all the necessary aspects and modified the user routines, go to 'Calculation management > Prepare batch calculation' and we are able to start the CFD calculation right now. Firstly, 'Select the batch script file', i.e. click the button to browser a launch script file. As default, the file is named 'runcase'. 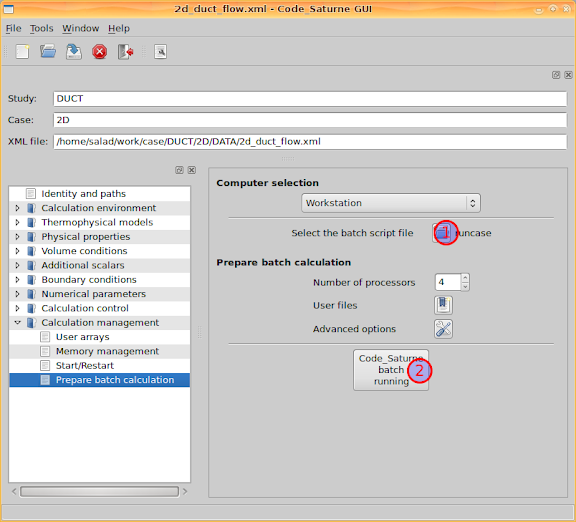 Then select the 'Number of processors', and click the button 'Code_Saturne batch running'. A console window will pop out and Code_Saturne will produce code to do the calculation. I assume that you are using more than one processor cores to calculate, and then you might be asked for your Linux system user password by openmpi before the calculation. Leave the calculation console for minutes and then, if lucky enough, you will see the calculation finished normally. If so, the next step is to see the results and do post-processing. Please read Part III of this article. 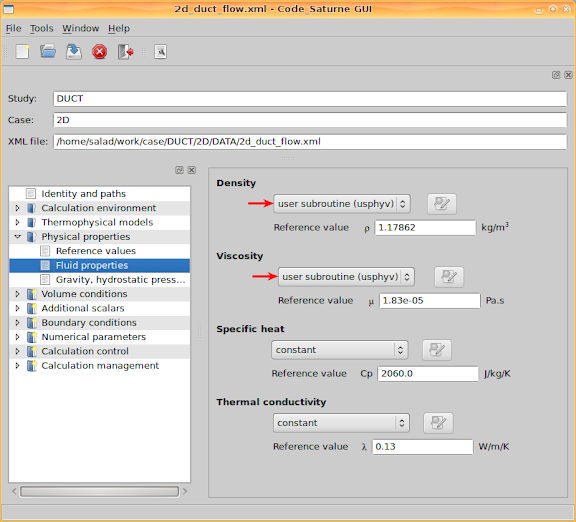 For the density expression you can also use the formula editor when libmei is installed. I know MEI, although I haven't tried it yet. Since the RC version is recently released, I am going to try it and publish new posts about it. Thank you for the post. Does the modified fortran subroutine first need to be compiled? If so, which version of fortran needs to be used? Thanks. Sergio Perez. Yes, the fortran subroutines will be compiled before running the calculation. In my posts I suggested gfortran, which was also used by the compilation of Code_Saturne if you followed my posts to install that. Thereby you don't need to install an additional fortran compiler. I guess g95 could work as well. Or you have Intel Fortran, which provides ifort. I'm trying to simulate the air flow around an airfoil profile. For this, I'm using Salome 5.1.3 & CS-2.0.0rc1. I've managed to obtain some pressure and velocity fields. 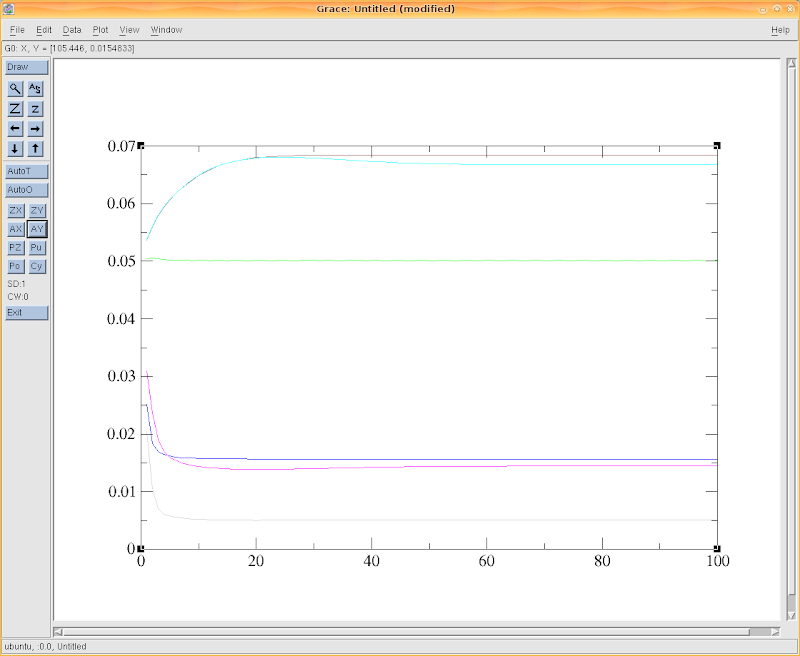 Now, I want to obtain a plot of the pressure coefficients on the airfoil, but I don't know how to do this in Salome/CS. Any ideas? Did you use SALOME to plot the pressure and velocity fields? I suppose it shouldn't be difficult to plot pressure coefficients in ParaView, as there is a calculator filter there. 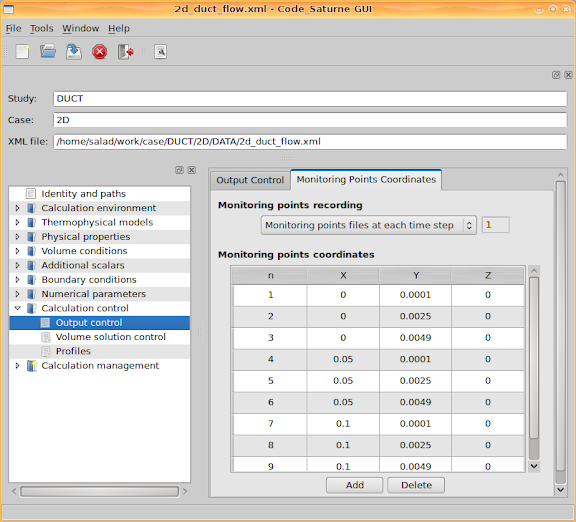 With the help of the calculator you can based on the known parameters compute new parameter values which interests you. Is there any tutorial in conjugate heat transfer like heatsink seating on top of an IC that is with varied amount of cooling air running arround? I don't have one on hand. However, although the geometry will be more complicated than a single flow duct, the calculation with Code_Saturne would be quite similar. That also depends on, in your case, if you have to consider turbulence models. If the geometry is built up from duplicated units, python scripts in SALOME would be helpful very much. Are you simulating a heat sink for an IC? It is interesting. Yes, I'm working on cooling an IC with heat sink. One factor for this type of work is determining the minimum amount of air to let it stay cool, then you can decide the fan size. It would really be great if there will be some examples on how to set up this type of examples. Unfortunately I don't have an example like this at the moment. However, if in the process you study it, I would try to help fix the problems you encounter. I'm learning to tame this software right now. BTW, what's suppose to be the unit of the heat flux in the wall? Right now i'm learning using code saturne, and i use vers 1.3.3, and mesh generator GMSH. I make a simple geometry, and try to run a laminar flow to the geometry, but it ended in error, and i can't figure what cause it. Can i ask you in private (such as by email), and send you the mesh and xml file, so you can check where the problem is?? My gmail account name is salad00. You can send the files to me and I'll try to help. Otherwise, I will be quite busy next week and I am afraid I would only find some free time to help after I come back from Paris on 31 Aug. Thanks for the quick reply and response. I'll send you the files ASAP, and again, thanks for our help. Do you have any idea why this might be? My next plan was to do a channel flow example so thanks again for this tutorial. Do we just choose the runcase file at the final step? When satrune asks you to save the file before running does one just save the file as a .xml file in the DATA directory? I am pretty glad that you have solved the problem by yourself. I was travelling so wasn't able to answer your questions. iḿ having the same problem, please how did you solve it? can you please give me a hand with this issue. Roch Mechatronics is Manufacture, Exporter, Supplier of Laboratory and scientific Equipments including Autoclave, Incubators, Environment Growth Chamber, Stability Equipment, Fermenters and various other equipment which are used all over the World in all major laboratories, hospitals and scientific research centers. 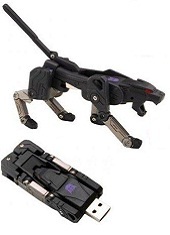 Go to http://www.rochmechatronics.com . yes, it's possible someone looking for autoclave, equipment, lab, oven, autoclaves information, and they were all end up getting autoclave, equipment, lab, oven, autoclaves info here, cause they know our autoclave, equipment, lab, oven, autoclaves site is the best! :-) . This is site allows you to access specific autoclave, equipment, lab, oven, autoclaves, manufacturer information. Helpful tips, tricks, and suggestion about autoclave, equipment, lab, oven, autoclaves, manufacturer. Thank you for your perfect tutorial. I'm going to write a fortran code to solve this problem by myself. Please can you help me deriving the main equations and bc's ?